Four casualties from Wales who lost their lives during the First World War will be commemorated by a large-scale sand portrait for Danny Boyle’s Armistice commission Pages of the Sea it was announced today. On Sunday 11 November, the public is invited to assemble at one of thirty-two beaches around the UK and the Republic of Ireland at low-tide for an informal, nationwide gesture of remembrance for the men and women who left their home shores during the First World War. A large-scale portrait of the fallen from Wales, designed by sand artists Sand In Your Eye, will be drawn into the sand on Swansea Beach, Fresh Water West (Pembrokeshire), Colwyn Bay and Ynyslas (Ceredigion). The portraits will be washed away as the tide comes in. In addition, the public will be asked to join in by creating silhouettes of people in the sand, remembering the millions of lives lost or changed forever by the conflict. Each of the beaches taking part in the project will commemorate a different First World War casualty. 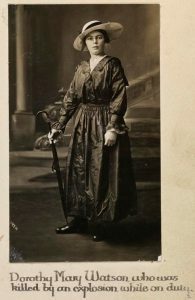 Dorothy Watson was a 19-year-old Munitions Worker (known as Munitionettes) who was killed in an explosion at the National Explosives Factory in Pembrey in July 1917. Three others died in the same explosion and the joint funeral of Dorothy and Mildred Owen (18) brought Swansea High St to a standstill. The procession was headed by fellow Munitionettes in their uniforms. Bridgend-born Major Charles Alan Smith Morris was originally gazetted to the Bedfordshire Regiment. In 1917 he was wounded in action on the Western Front at La Courcelette and was posted as missing, believed killed. Several months later, his Uncle Charlie received a packet from the Red Cross with news that Charles had been found and taken to a German field hospital where, sadly, he later died. 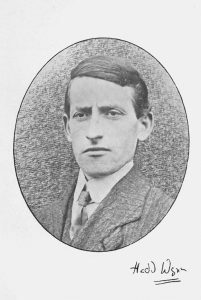 Hedd Wyn (Welsh for Shining Peace) was born in Trawsfynydd, North Wales on 13 January 1887 and killed during the Battle of Passchendaele, on 31 July 1917. He was a Welsh language poet who won his first bardic chair in 1907. 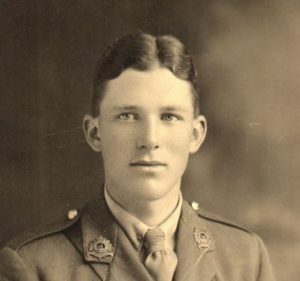 Whilst in Flēchin, France, waiting to move to the Front at Ypres, he finished writing and submitted a poem, Yr Arwr (The Hero), to the 1917 National Eisteddfod. When the winner of the Bardic chair, with the pen-name ‘Fleur-de-lis’, was called to receive his prize during the chairing ceremony of the National Eisteddfod in Birkenhead in 1917, nobody rose. Hedd Wyn, the victorious Bard had been killed a few weeks previously on the battlefield in Flanders. The empty chair was covered with a black veil and from then on, the Birkenhead Eisteddfod 1917 was known as “The Eisteddfod of the Black Chair”. 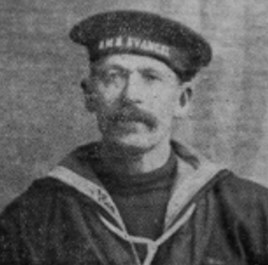 Richard Davies was born at Borth on 29 December 1863. Married to his wife, Mary Davies, and their six children, Richard worked as a labourer but was also a Royal Naval Reservist. He was recalled to the colours at the outbreak of war and was posted to HM Trawler Evangel. She was used for anti-submarine duties in the Irish Sea, sailing from her base at Milford Haven. On 25 March 1917, Evangel was on patrol off Milford when she struck a mine which had been laid by the German submarine UC-48. It sank with the loss of 25 lives. Richard (54) was among the men killed that day. His body was recovered from the sea, and he was buried at Penygarn Calvinistic Methodist Cemetery, Tirymynach in Ceredigion. A series of community-led events will also be taking place at each beach. People who can’t make it on the day will be able to watch the activities and portraits from most of the beaches on social media on Sunday 11 November. The work is the culmination of 14-18 NOW, the UK’s arts programme for the First World War centenary.